It’s not every day that you are asked to solve a very expensive problem for a large aquarium. A fire had damaged the large PMMA front of the shark tank for a famous aquarium. Replacing such a large piece of PMMA would have been very expensive. But it was unthinkable to risk having it fail whilst full of water and sharks. With the aid of a few drops of liquid and a deep understanding of HSP and environmental stress cracking (ESC), one of us (Hansen) was able to say authoritatively that the tank was entirely fit for purpose – a decision vindicated by many years of safe use since it was refilled. We’ll discuss a rather simpler example in this chapter, but it’s good to know that the principles can be applied to many different situations, including large shark tanks. ESC is a huge practical problem. It is said that at least 25% of failures in plastics are caused by it. Almost by definition it is a difficult problem. Yet HSP can very quickly tell you if you are likely to be in an ESC danger zone. Let’s remind ourselves of the problem. You have a polymer part that you don’t want to be damaged by contact with solvent. So you do some tests with a range of solvents. If you try a good solvent (i.e. inside the sphere of the polymer) then, yes, you have a problem in that the polymer dissolves. But really this isn’t a serious problem. The test takes a few moments and you then know that you must keep that solvent away from that polymer part. If the part has to handle that solvent then you have to change the polymer. With a solvent you know to be outside the sphere you know the answer in advance but you do the test anyway and, of course, the solvent doesn’t do anything to the plastic. It will not be a problem, so you say that this solvent is safe to use. And yet, some days, months, years later after exposure to this “safe” solvent the plastic suddenly cracks and you have an expensive repair bill or an angry customer. Where had you gone wrong? The answer is in the thermodynamics. You’d rightly concluded that there was a net increase in energy if the solvent infiltrated the polymer and therefore it would not interact. What you’d forgotten was the “S” in ESC. The stress is another factor that can tip the thermodynamic balance. If you have a large concentration of stress, and if the solvent and polymer are near the thermodynamic tipping point then the solvent can enter the plastic and, snap, you have your cracked or broken part. When the problem is expressed in these terms, the solution is obvious. You will only get ESC from solvents that are near the border of the sphere. Solvents inside give dissolution and you easily identify them. Solvents far outside will never be close to the thermodynamic limit and will therefore never cause ESC. So for those of us who have to worry about ESC the rule is simple: Beware of solvents at the boundary – and therefore make sure you know where your boundary is. Here is a typical example based on the Topas 6013 ESC example in the Handbook. This doesn’t tell you much about ESC. For the next plot, solvents that tended to show ESC are included in “Inside”. The calculated HSP and radius has changed. The point of this plot is that the solvents outside this radius are almost certain to be safe from ESC. The “almost” is there for two good reasons. First, the radius defining ESC depends strongly on the Stress. If the stress is low, then the radius is close to the first plot. 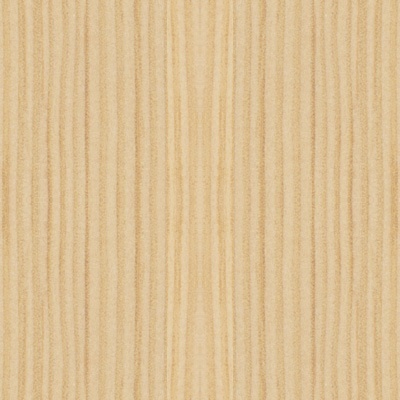 If the stress is high then the ESC radius will expand. Only you can judge the level of stress and therefore the margin of safety for solvents. Second, the molar volume plays a role. Smaller molecules are able to diffuse more easily into the polymer and contribute to the weakening of the polymer and potential cracking. So when you form your judgement on whether a solvent outside the radius is safe, err on the side of caution if that solvent is small. It’s important to stress the “stress” part of ESC. At a high enough stress a polymer will crack even with a poorly-compatible solvent. An excellent paper to illustrate this point is C. H. M. Jacques and M. G. Wyzgoski, Prediction of Environmental Stress Cracking of Polycarbonate from Solubility Considerations, Journal of Applied Polymer Science, 23, 1153-1166, 1979. PC parts were stressed to different extents and placed in test solvents. In each case there was a critical stress above which the part would crack. For obviously good solvents such as toluene, the critical stress was low (<0.3%), for obviously bad solvents such as ethylene glycol the stress was high (>1.9%). Not surprisingly, there is a general correlation between low RED number and low strains before cracking. But what is also clear is that low molar volume solvents must be further away from the PC (i.e. higher RED number) – in other words, for a given RED number, small molecules give more stress cracking. 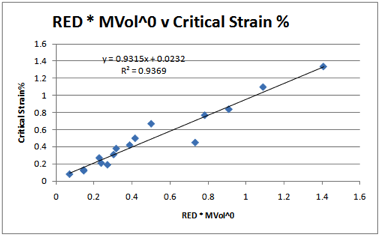 In a graph (not shown) of RED v strain required to crack, there is a general trend (as expected) that high RED requires high strain. But the fit is very poor. 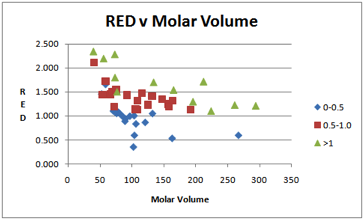 Instead, a fitted trend was created using a combination of RED and Molar Volume. 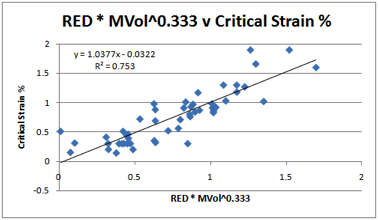 It turns out that the best fit comes from RED * MVol0.333. And the best fit was found with the HSP values mentioned above. Clearly the correlation isn’t perfect. Nor should it be. For example a detailed analysis in the Jaques’ paper shows (as we would expect) that branched hydrocarbons require a higher critical strain than unbranched equivalents because (as discussed in the Diffusion chapter) branched solvents diffuse more slowly. On the basis of these four polymers a tentative conclusion can be reached about the MVol effect. The Sphere radii for the four fits are: PMMA 8, PC/PSF 10.5, PPO 13.5. It seems reasonable (though of course it is unproven without considerably more experimental data) that for polymers with large radii (PPO), the ease of molecular access is high so the MVol effects are small. Conversely, for polymers with smaller radii (PMMA) there is a far greater specificity and therefore a larger dependence on MVol. For the ESC predictor described below we have set up a MVol dependency varying from a minimum of 0 at 13 and above linearly up to a (fitted and meaningless) value of 2.2 at a radius of 0. This means that a Sphere of radius 7 has a linear dependency on MVol. Readers will be unhappy with the tentative nature of the above. But those who wish to criticise should first consider the amount of work required to get good data. First there is the basic experimental data. It is thankless and dull work to get data over a sufficiently large range of solvents that span both the HSP space and also MVol space. Only two of the correlations feature molecules with MVol > 150 so it is hard to get statistically meaningful fits. Second there is comment from these authors that there is no substitute for the original data. Some of the values for some of the polymers quoted in some secondary literatures are just plain wrong. It was a sobering experience to spend the time entering data from the secondary literature, getting absurd plots, then discovering that the data had been misquoted. For old polymers there may be no reason to re-do the ESC data as the user community more or less know which solvents to avoid for long-term use. But with so many new bio-polymers coming on the market it would seem a good idea to invest the time and energy producing critical strain data. Although it is a lot of effort, compared to the consequences of an unexpected failure out in the real world it would seem to be a good investment of scientific time. Because users of HSPiP wanted an ESC predictor we have provided what we call an ESC guide. Because ESC depends on HSP, on MVol, on branched/unbranched solvent shapes, on stress and (sometimes) on surface stress it’s simply not possible to provide a complete ESC predictor. Instead we’ve provided a colour-coded guide that follows the rainbow. The colours are based on the combination of RED and MVolx, where the power x varies from 2.2 to 0 between a radius of 0 and 13. The larger the Sphere the more solvents will be caught in the ESC trap, so it’s important that you know what your sphere is based on. If it’s based on solubility then it will tend to be on the small side. If it’s based on a critical stress value then it’s more likely to be realistic. Red and yellow are for molecules usually well inside the Sphere. These will probably not cause ESC simply because they will obviously damage the polymer in early tests. Such solvents have been known to give ESC, however, when they have been found in aqueous mixtures even at very small concentrations. If the water can evaporate, the solvent concentration can become very high, and ESC has been found. Greens will tend to be around the border so should be prone to ESC. Blues will tend to be far-enough away to provide low ESC probabilities. But remember that if the stress is large enough almost any solvent can cause ESC. 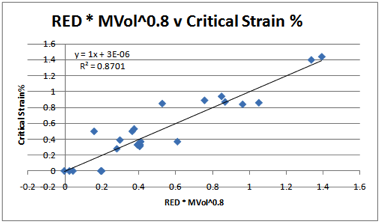 Figure 1‑7 ESC colour-coding taking into account MVol as well as RED. Blue is typically safer than green. 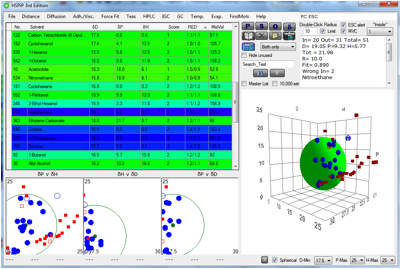 The data shown are in the middle of the range. It’s therefore up to you to use the colour guide as a guide. To summarize: to avoid ESC make sure that the solvents used are well outside the Sphere and have a large molar volume and, if possible, branched, low diffusion shape. If your polymer will encounter larger stresses then the solvents will have to be further outside the sphere with an even larger molar volume. On the polymer side it is known that incorporation of a smaller amount of higher molecular weight polymer (bimodal) vastly improves stress cracking resistance, while still allowing for acceptable processing conditions. This is reminiscent of the phenomena discussed early on adhesion and polymer chain entanglement. The intimate mixing of polymers having widely different molecular weights is possible by simultaneous use of two different catalysts for polyethylene, for example. These theoretical considerations can be illuminated by some practical examples encountered by Hansen. ESC with PC has been found on evaporating insulin solutions stabilized with 0.15% m-Cresol. There are also examples of surfactants in automotive windscreen cleaners that have cracked PC parts on the car. Then there is the classic of the stick-on label on a PC helmet giving ESC. An example of ESC with serious environmental consequences arose several years after the gluing of a PVC joint. There was a little piece of a rag in the threading that over time gave enough stress to initiate the crack. The PVC near the rag failed in a mode that started with stringing polymer, which meant solvent in some quantity was present, and this then extended through the whole joint and gave an environmental catastrophe since strong base in a large amount got into a nearby stream. This was a large media event at the time, and all because a solvent wiping rag was able to initiate ESC.